Defense Forces Day is a public holiday in Zimbabwe celebrated the day after Heroes' Day (the second Monday in August). It is typically marked with a military parade that takes place in the capital city of Harare. 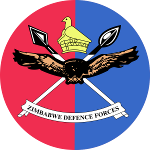 The Zimbabwe Defense Forces (ZDF) in their current form were established in 1980, following the end of the civil war and the official recognition of the country's independence. The ZDF comprise the Zimbabwe National Army and the Air Force of Zimbabwe. The Zimbabwe Republic Police can be regarded as part of the country's military, but it is subordinate to the Ministry of Home Affairs. As of 2007, the ZDF had an estimated strength of 29,000 active military personnel and 21,800 paramilitary personnel (including 2,300 personnel in the Police Support Unit). The government of Zimbabwe spends considerable amounts of its wealth on training for its military personnel and military equipment. Defense Forces Day is one of the most important holidays in Zimbabwe. The festivities are held throughout the country, but largest celebration takes place at the National Sports Stadium in Harare. The president delivers a solemn speech, which is followed by a flag hoisting ceremony and a colorful military parade.